The decor is a blast from the past, but the menu is the best hits of international street food. Grilled hanger steak, yucca fries and chimichurri. Photography by Angel Tucker. itting at a bar watching Breakin’ with a draft beer is a disturbing amalgam of retro and reality. Even those of us who lived through it have a hard time piecing together the ’80s, given the decade’s penchant for revolutionary communication and devastatingly bad taste. True, we got personal computers, MTV and Run-DMC, but much of the country was wearing Members Only jackets and jazz shoes while exploring the new frontier. An unfortunate coalescence. One might wonder why Sean Larkin, owner of Revival Brewing, would choose just this axis for his new restaurant, Troop. It could come off as a caricature if the staff and space weren’t so committed to a modern translation. (Doc Martens are everywhere; shoulder pads are nowhere.) Servers are in full-out homage mode, dressed overtly in Adidas track suits, or simply inspired by the more defiant artists of the day. Most of the guys interpret things loosely: big beards, vintage T-shirts and a gait that follows the insistent bass line. 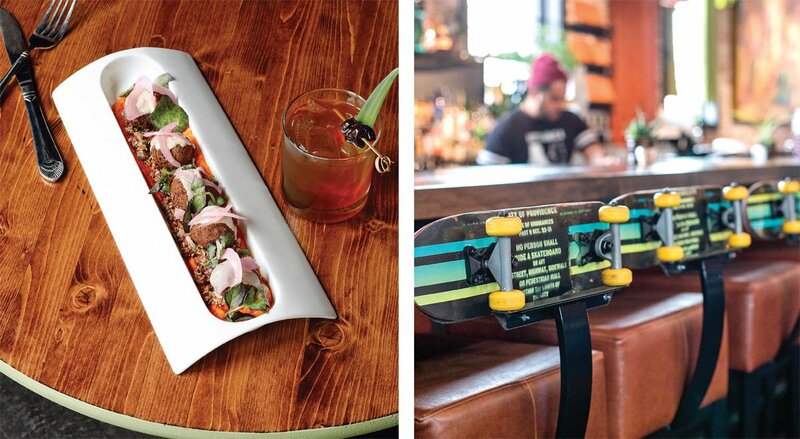 At its core, Troop is a bar that serves really good food, a designation that’s made in attitude rather than inventory. The approach is similar to James Mark’s north, an establishment that’s gastronomically progressive but fundamentally rebellious: You can call it a restaurant, but the ownership is not interested in joining the established brigade. Street noodles, mixed veggies and ginger sauce. Photography by Angel Tucker. Troop’s insubordination, however, plays out in designer Kyla Coburn’s take on cultural icons: towers of boom boxes, a neon NYC walk/don’t walk sign, used Bingo cards and barstools with skateboard supports. Toy guns on the wall hang over Astro-turf rugs and palm-like pendant lamps and, if the space feels as if it walks the thin line between Public Enemy and the B-52s, then it’s captured the era pretty well. Fifty-year-olds drinking Revival drafts by the potted philodendron, however, are in their own cross-cultural time warp. From any location in the industrial room, people are drawn to the TVs, illuminated with clips of impressively legit breakdancing and the awkwardly mainstream imitations of it. (Cut to RAD, in which Lori Loughlin is breakdancing on a Schwinn at a high school dance and you’ll see American culture collapsing onto itself.) The paradox of the ’80s, simultaneously aggressive and animated, is on full display and, even in the food, it’s irrefutably entertaining. Jason Timothy’s offerings make it clear that this is an ode to the past and not a re-creation. Vegetables are everywhere on the internationally styled menu. There are twelve to fifteen dishes per night and, while the decor is uniquely American, the food takes its cue from street carts and small cultural pockets around the country. Bean falafel with carrot hummus and quinoa. The barstool backs are made of skateboards. Photography by Angel Tucker. If the vegetarian options are the effervescent side of the ’80s, entrees carry the intensity. Korean short ribs are doused in hot chili sauce, still chewy enough to evoke jerky but fundamentally authentic. Fried chicken is a nod to the American South, served on porked-up collard greens with hot vinegar sauce. It’s down-home in the same manner Troop is: evocative but so familiar that it always brings back some affectionate place long forgotten. 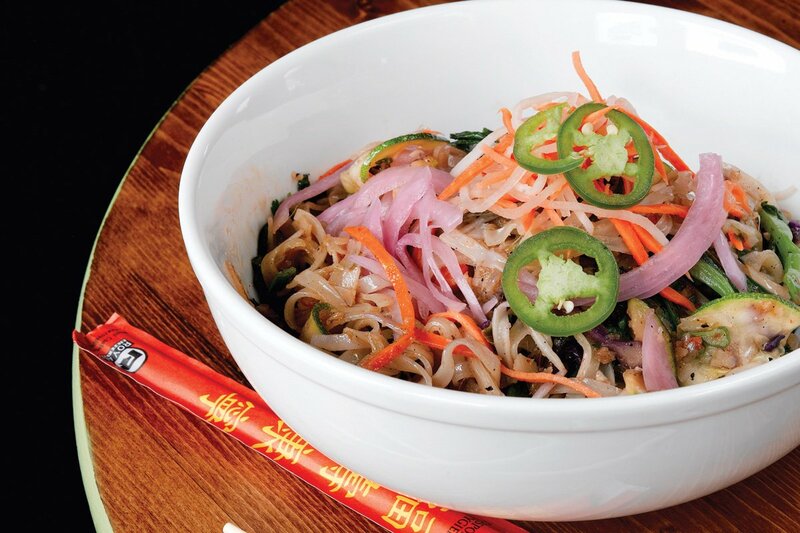 Even the rice noodles (made with, according to the menu, “street sauce and love”) are an amalgam of Far-Eastern influence that reminds you of why the States fell in love with Asian food forty years ago. 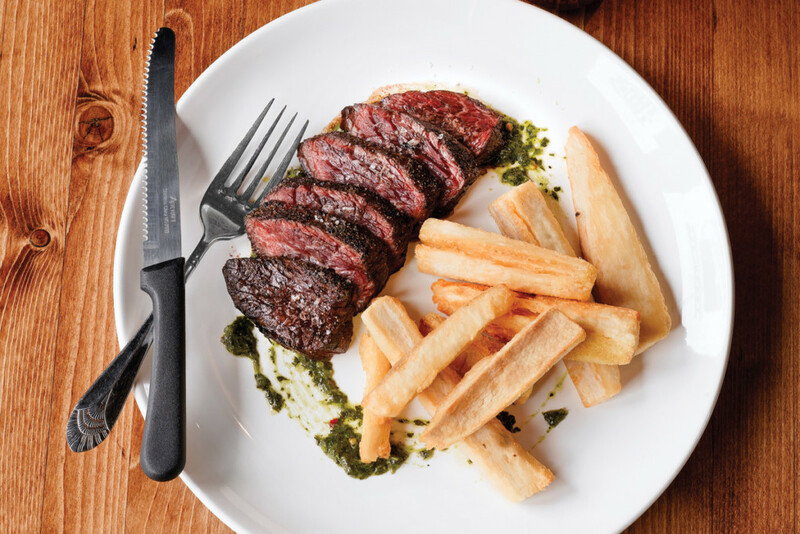 The restaurant even manages a nod to South America with a stellar hanger steak in chimichurri with yucca fries, which might be mainstream if it weren’t for the perpetually spirited staff. They regularly take a seat on the pint-sized stools perched at the open end of each booth to deposit silverware or discuss drinks for the night. One waitress, placing fries in front of a thirteen-year-old diner, answered his question by leaning in and saying, “Yes, I can bring you ketchup. But I need you to taste the aioli first.” He pulled his gaze away from the screen just long enough to dunk a yucca wedge and approve the sauce. “You’re cool,” she responded and walked off past the Periodic Table of Hip Hop. No doubt Troop could fill its space with people happy to down a series of Revival drafts, but that’s not the only demographic. Every person in the place bounces a little in their seat — and that includes the occasional baby lulled to sleep by Bell Biv DeVoe. 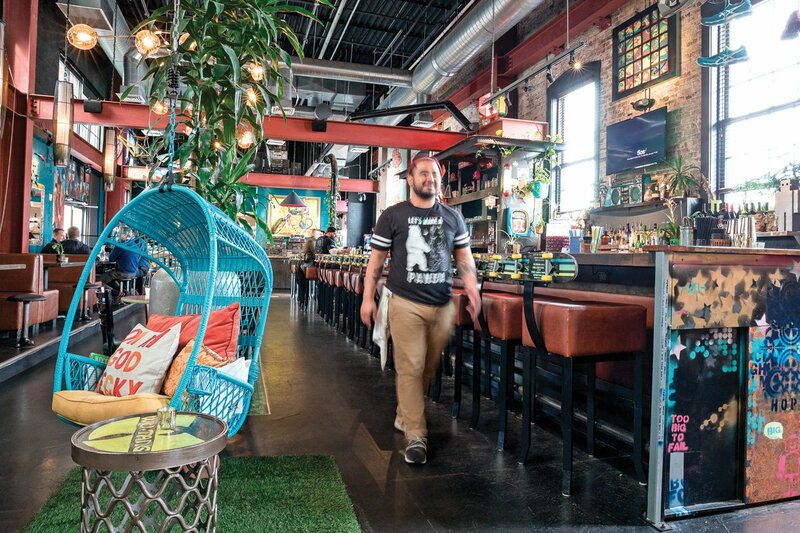 This is a restaurant that pivots quickly between its B-Boy stance and a sense of humor, and that creates space for a fifty-year age span. The older end of the spectrum might take on the fig bread pudding with caramel sauce, but crème brulee covered in malted milk balls is an equal opportunity pleaser. Not so different from the mood in the room when Color Me Badd comes on overhead. It may be part tribute and part parody but, suddenly, the entire room is joined in communal memory. If food brings the masses together, Troop proves that music does the same thing with a broader reach. So tap the keg. Or pour a soda. You just found the house party of your dreams. 60 Valley St., Providence, 473-2900, trooppvd.com. 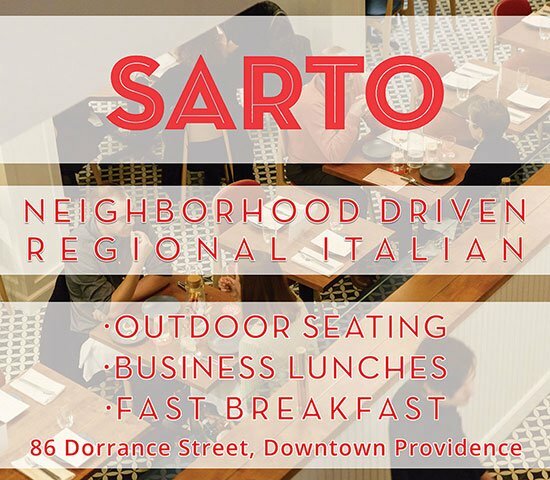 Open for lunch Wed.–Mon., dinner seven nights, late-night menu Thurs.–Sat. Wheelchair accessibility is no problem for some tables; bar seating and booths are raised. Lot parking. Vibe NWA meets Bruno Mars. Prices Appetizers $7–$13; entrees $12–$17; dessert $6–$9. Karen’s picks Black bean falafel, street noodles, hanger steak. Everything needs to be preceded by or washed down with a beer.